Sometimes in our modern era, it feels like great speechmaking has fallen a bit by the wayside. Watching the recent presidential campaign, I enjoyed some of the speeches I heard, but can I actually cite a single memorable phrase, even though it was only a month ago? I actually can’t—and yet I can recite bits of speeches that were made decades or even centuries ago and which I never got to hear in person. Here are my picks for 10 of the most inspirational speeches in history. Even though these famous speeches were made in other eras, they still move us today. King George VI’s radio address to the citizens of Great Britain following his emergency ascension to the throne. This speech was not only inspiring because it helped prepare Britain for war with Germany (possibly the only reason we aren’t all wearing Nazi armbands today), but also because he had to overcome his own terror of public speaking to make it. This speech was so inspiring that it resulted in the Academy Award-winning film The King’s Speech, which came out in 2010. Did you know Sir Winston Churchill was also born with a speech impairment? He overcame it to become one of the greatest military leaders in history, and inspired Britain to forge ahead with the war in the darkest times with many great speeches. His most famous speech was delivered in the House of Commons on June 4th, 1940. The speech is known as “We shall fight them on the beaches,” and declared that it the war wouldn’t end without victory. At a time when Britain stood alone against the Nazi empire, it rallied a nation to fight on despite overwhelming odds. John F. Kennedy’s inaugural address (“Ask not what your country can do for you”) probably stands as one of the most oft-quoted speeches in history, but there’s good reason for that. It really was tremendously well-written and memorable, imbued with a kind of forward-looking optimism that has become harder and harder to find. Alexander the Great’s speech in 335 B.C. Sadly none of us will ever actually hear this speech, but the promise that he would make “those who stay the envy of those who return” was very powerful. It’s pretty tough to get anyone excited about continuing to march into battle when they already have plenty of (good) reasons to quit, but he certainly pulled it off. Patrick Henry’s “Give me liberty or give me death!” speech is another one which the history books all remember, and which most of us can still remember from high school history lessons. There’s a reason that speech sticks in our minds. It says in the simplest way possible that there are some things that a free human being can’t stand for, and that some things are actually worse than death. How often do you find that level of commitment anywhere? t another speech that none of us will ever get to hear with our ears, but there’s no denying that it was the right place at the right time for this man to deliver words which irrevocably changed the lives of not only those who heard it, but the pathways chosen by future generations for thousands of years. Martin Luther King’s “I Have a Dream Speech.” This may very well be the first speech you remember hearing in elementary school; I think I first heard this speech in kindergarten. This speech is often overlooked in a way however because of its fame; have you ever actually watched it in its entirety? It’s well worth it. Sinners in the Hands of an Angry God by Jonathan Edwards may not seem like the most obvious choice, but it’s the best example we have of the Great Awakening ideals which made religion more personal in the U.S. during the 18th century. This was part of a larger movement toward religious freedom, one which also urged people to take personal responsibility for their actions. 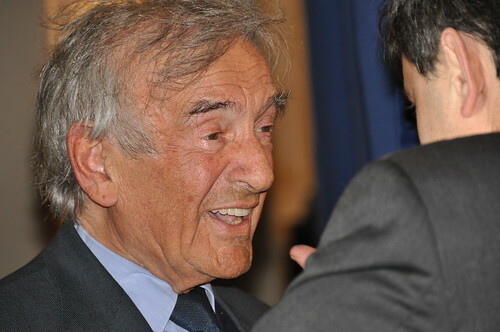 Elie Wiesel’s speech against the Perils of Indifference at the turn of the millennium. This speech, like the previous entry, may not seem like an obvious choice, but anyone who has ever suffered because of indifference knows that indifference can be an even greater obstacle to overcome than outright malevolence. In many ways, indifference is the opposite of inspiration. Inspiration drives us to care about something, but indifference represents the temptation to care about nothing. There have been many great speeches against evil, but not too many against indifference. Neil Armstrong’s “One small step for a man, one giant leap for mankind” speech is one of the most inspirational speeches ever delivered because it was the first words spoken on the moon—and sadly among the last. The era of human exploration seems to have come and gone, and why? Not enough of the kind of larger-than-life inspiration which all these great orators have delivered over the thousands of years of human history. Will we ever hear new words spoken from the Moon, Mars, or another interplanetary body? That probably depends on whether we become inspired as a species again. It’s interesting that if we look back in time and think about inspiring speeches, most of the most motivating and compelling examples of great oratory work we find happen amid great upheaval during wartime or times of civil strife. Even Neil Armstrong’s speech from the surface of the moon was only possible because of the Cold War. Going forward, maybe the biggest thing any of us can realize is that we don’t need strife to motivate us — what we really need are people who truly are larger than life, who can be inspired to bring beauty and accomplishment into our lives even in times of mediocrity. Maybe we’re not currently in the midst of a world war or a cold war, but the indifference Elie Wiesel talked about is everywhere, and we can all go to war on that just by taking a few minutes out of our day to get inspired. So look up some of the most famous speeches in history! Who knows—one of them might just change the way you look at your own life. I’d have to disagree with this list. I find it rather odd that someone who might not even have existed, Jesus, is on this list, and one of the most inspirational men of all times is not, Bobby Kennedy. What about his Ripple of Hope speech, or Mindless Menace of Violence or all his other speeches for that matter? I agree those were incredibly inspirational speeches, but there are only 10 spots. Whether not Jesus existed, you would have to agree at least that The Sermon On The Mount has inspired many more people over the course of history than any speech by Bobby Kennedy, as great a man as he was. My favourite inspirational quote is Patrick Henry’s “Give Me Liberty or Give Me Death”, if I had to live without my freedom, it won’t be a life for me so I’d rather die.